Books and booklets are key applications for the digital print market. The on demand print space targets short-run applications that must be finished in short turnaround times. Data hygiene is critical to effective personalized marketing. Sending information to outdated and misspelled names or including the wrong address results in poor response rates. Canon recently invited customers, as well as industry press and analysts, to participate in a two-week event this May in the company’s Poing, Germany facility. Printed output—especially communications meant to make a marketing impact—requires careful consideration across all angles, from design, print, and finishing quality to functionality and uniqueness. To remain successful, print providers look out for the latest technologies and strategically invest when the timing is right. 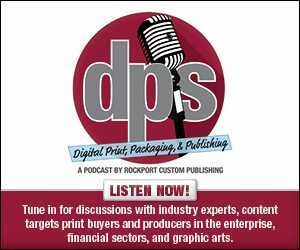 There’s been a lot of punditry and speculation about how digital print will impact packaging printing, whether it would go the way of commercial print, with shorter print runs and variable data-driven versioning. Digitally printed label and packaging applications expect continued growth. Digitally printed applications benefit from coatings for aesthetic and practical purposes.